As any dog lover knows, no family camping trip is complete without your furry friend. But, when travelling with your pet, it can be tricky to fit all your camping gear in the car, especially if you’ve got a bigger dog who needs a little more space. If you’re heading out on a family camping trip, you’ll need to think carefully about how you plan to transport all your equipment with you. Here, we’ve shared four smart packing hacks to help you fit all your gear in the car, and still have plenty of space for your dog to travel in comfort. Just read on to learn more. If you’re working with limited space in the car, it’s worth taking a second look at your camping inventory and being strict with yourself about what you really need. If you’re low on space, get all your camping equipment and supplies out in the garden, and remove any items which you think you can do without. You’ll probably find that you’re packing items you’ll never even get a chance to use, so stick the essentials. Don’t forget that you can buy certain supplies once you arrive at your campsite, too. Unless you’re camping in the middle of nowhere, you can buy food and other basic supplies once you reach your destination, so there’s no need to pack more than a few snacks for the journey. Certain campsites will even let you hire some basic equipment, like camping stoves, so check in advance to see what’s on offer at your destination. If you only have a small car, or if you’re bringing more than one dog with you, then it’s unlikely that you’re ever going to fit everything in the boot. Overloading the car can be dangerous, especially if your luggage obstructs your view of the rear windscreen, and overpacking can make long journeys cramped and uncomfortable. So, instead of trying to squeeze everything in the boot, invest in a roof rack and storage box, or try one of these ERDE box trailers, which are the ideal size for towing camping equipment. This way, you won’t have to stress about fitting all your equipment in the car, and the whole family will be more comfortable during your journey, including your dog. And, once you have the trailer, you can even use it to store your camping gear, meaning there’s no need to unpack between trips. Just make sure your trailer is securely locked up in a garage or other safe spot when not in use. If you need to reach your campsite by a certain time, then make sure you leave yourself plenty of time to load up the car. When you’re short on space, you’ll need to take the time to stack your luggage in a logical way, instead of just throwing everything in the boot. This will help you to make the most of the space you’ve got, so set aside an hour or two to fit everything in. Start by laying all of your equipment out next to your car. This way, you won’t get halfway through and realise that you need to start over to accommodate something you’ve forgotten. Begin with any larger items, and then pack smaller items, including any softer items like clothes or blankets, around them. This will help you to make the most of every nook and cranny. You can always unroll any sleeping bags to help fit them around bulky items. When travelling with pets, it’s important to keep your furry friend safe in the car, especially if you’re going on a long car journey. If you plan to put your dog in the boot for the duration of your trip, then consider putting them inside a pet crate to keep them safe. 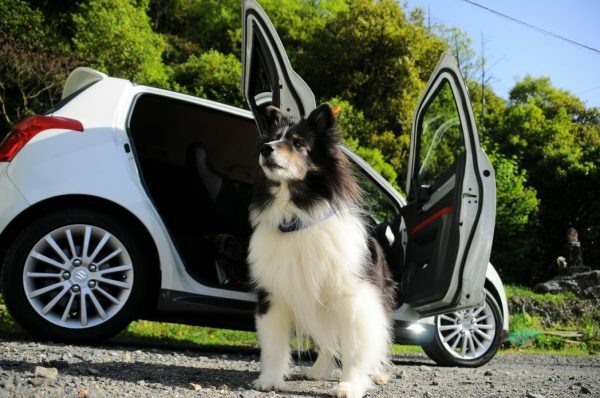 This will help to keep them secure in the event of a car accident, and it will also stop any luggage you have in the boot from falling on — and potentially injuring — your dog. If your dog suffers from anxiety during car journeys, an enclosed pet crate can also help them to feel a bit more secure. Smaller dogs can ride in the backseat, leaving you more space in the boot for all your camping gear. Just make sure you use a pet harness to keep them safe during your journey. These are specialised harnesses that work a bit like a seatbelt, meaning your dog will stay secure should you have to brake suddenly. If your pooch isn’t a fan of sitting still, then a harness will also keep them from exploring the car and distracting you as you drive. This selection of pet harnesses from Doggie Solutions will keep your pet comfortable as well as secure, and they offer a range of sizes to suit dogs of different breeds. A camping trip is all about family fun, so don’t let the journey spoil your trip. Just take these clever packing solutions on board, you should be able to carry all of your camping gear and still have plenty of room for your furry friend.